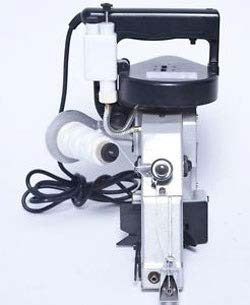 This high quality bag closing machine has a steel cam and is made to last, while still being reasonable priced. Designed for continuous operation, the single thread chain stitch can be used for agriculture	products,animal feeds, fertilizer, flour, chemicals, pellets and other powdered materials	This versatile bagger also sewa on horizontal surfaces and can be used to join two fabrics. The bag stitcher is fitted with a plastic handle for insulation and it features an oil pump lubrication system with oil lines, to ensure an extended lifetime.